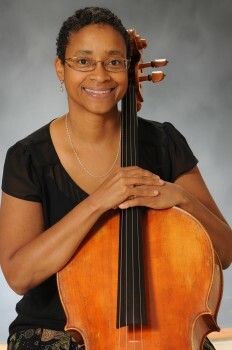 MILLIGAN COLLEGE, TN (Oct. 7, 2013)—Cherylonda Fitzgerald, adjunct instructor of music at Milligan College, is the guest artist at the Johnson City Symphony Orchestra’s Oct. 12 concert in Milligan’s Mary B. Martin Auditorium of Seeger Memorial Chapel. The concert begins at 7:30 p.m. Admission is free for Milligan faculty, staff and students with a current Milligan ID. All other tickets are $35, $30 for seniors (65+) and $10 for students. The symphony opens its 44th season with the theme “Dreams and Inspirations.” The opening concert is titled “Tragedy to Triumph” and will include the music of Antonín Dvořák and Jean Sibelius, under the direction of Robert J. Seebacher, music director and conductor. The concert is sponsored by Mountain States Health Alliance. Fitzgerald, principal cellist for the JCSO, also performs with the Kingsport Symphony of the Mountains and the Asheville Symphony. She teaches at Milligan and East Tennessee State University, as well as giving private lessons. She is also a founding member of The Paramount Chamber Players, a group of musicians dedicated to sharing chamber music with local audiences. Dvořák, considered one of the great Czech composers, wrote two cello concerti, but the “Concerto for Cello in B minor” is the most well-known. One of the themes of this concerto suggests a love story; the concerto is a memorial to Dvorak’s sister-in-law, who apparently was the real love of his life and who died while Dvořák was in America. There is love and longing in this piece as well as anguish for her loss. Sibelius, as is Dvořák, is inextricably tied to his country of origin, Finland. Even though his “Symphony No. 2 in D Major” was written while Sibelius was living in Italy, this piece was quickly perceived by Finns as a protest against the incursions of neighboring Russia. There is another interesting parallel between the two composers and their music in this concert: Dvořák mourned the death of his sister-in-law, and—according to his wife—Sibelius’ theme was his response to the suicide of his sister-in-law. The two works show us both tragedy and triumph, the theme of the concert. For ticket information, visit www.jcsymphony.com or call the JCSO office at 423.926.8742. Concerts are partially funded under an agreement with the Tennessee Arts Commission and the National Endowment for the Arts. Posted by tommy on October 7, 2013.